It is not uncommon for yards to have a few areas where the grass dies just above the soil. This layer is known as thatch, and while some of this dead grass can be beneficial, it is not helpful when it builds up. This accumulation can prevent air and water from reaching your grass, causing brown spots to take over your lawn. As a general rule, if you have more than a half-inch of dead grass, it’s time to get out the rake. How Do I Dethatch My Lawn? The process is quite simple and only requires a convex rake or power rake (a convex rake is used for small batches, and a power rake is used for larger spaces). When using a convex rake, use the same motion you would with a regular rake. Let the tines dig into the soil, pull upward, and lift it out of the loosened soil. With a power rake (also called a vertical cutter or verticutter), this process can be a little harder, given that the equipment is large and can require some strength to maneuver. Before beginning, adjust the blades so that they go no deeper than one-half inch into the soil. Once this is done, you can begin dethatching your lawn like you’re operating a lawn mower. Over time, soil naturally begins to compact, preventing water, air, and nutrients from fully reaching the roots. 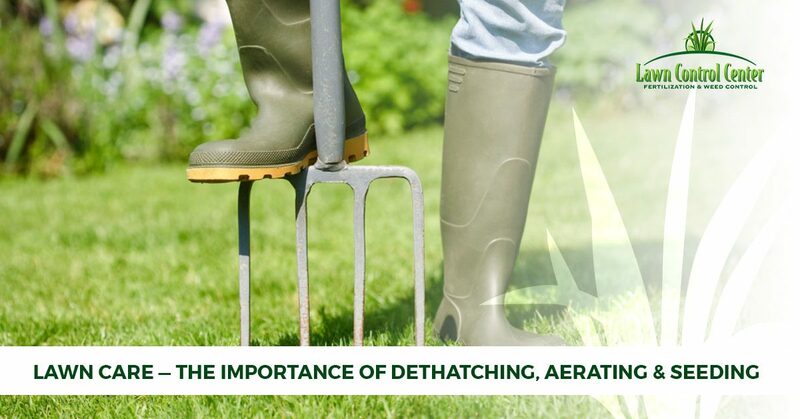 Aeration prevents this compaction, allowing roots to grow deeper and stronger and, therefore, more drought-resistant. On top of this, lawn aeration can also remove mild thatch. How Do I Aerate My Lawn? The first step is to choose what type of aerator you’ll use: a spike or plug aerator. Although spike aerators can sufficiently accomplish the job, they are notorious for not properly removing soil and actually increasing the soil compaction. For this reason, most lawn care centers will recommend using a plug aerator. This reliable mechanism removes plugs of grass and soil roughly two to three inches deep. The summer and early fall can scorch your lawn, often creating unsightly brown patches of thin grass. Overseeding your lawn can help restore these brown spots. Even if your lawn is healthy and green, adding seed can further fill out the grass, making it even lusher and stronger. Fall is the perfect time to seed your lawn. During the cool autumn months, new seeds are able to retain moisture, germinate, and become established without contending with the sun’s brutal heat. How Do I Seed My Lawn? The first step is to choose a grass seed that is right for your lawn. The goal is to find a seed blend that features two or more cultivars of the same species. Also, be sure to calibrate your spreader to match the coverage chart on the grass seed label. Does this all seem like too much for you? You don’t have to do the job yourself. If you are in the Columbus or Cleveland area, contact Lawn Control Center. We specialize in lawn aeration, seeding, and more. Learn more about our services here and contact us today to get your free estimate.